Do your kids enjoy playing online games? Do you have a apps on your smartphone that you usually use and wish you can use those apps hands-free? Introducing Talon. 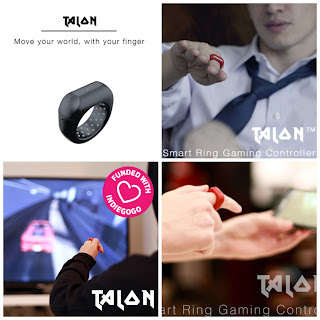 It is the world's first smart ring gaming controller. Yes, you read it right. It IS wearable smart ring that lets you play games and control apps with simple gestures and waves. Talon is currently being developed by Titanium Falcon, Inc. in San Jose, California. They are a start up company that aims to bridge the gap between wearable technology and online gaming. Their team is composed of experts in various fields, responsible for bringing an advanced hardware project like this to reality in a few months. I am sure you are excited to own a Talon. I am too! If you want to learn more about the product and how you can help to propel this wonderful device in the market the soonest time, please click HERE.